​Henry Glover was a West African photographer living in Hull in the early twentieth century. Although advertisements in the Hull Daily Mail reveal incidents of violence, racism and crime, they give an unjust and negative view of his life. Glover was a hardworking man with a good character, who was well-known in the city. He spent at least two decades in Hull and East Yorkshire. Henry Glover was born around 1881 in the Gold Coast region of West Africa. Although, we do not know a great deal about his early life, by the early twentieth century he had migrated to Hull and was working as a photographer. 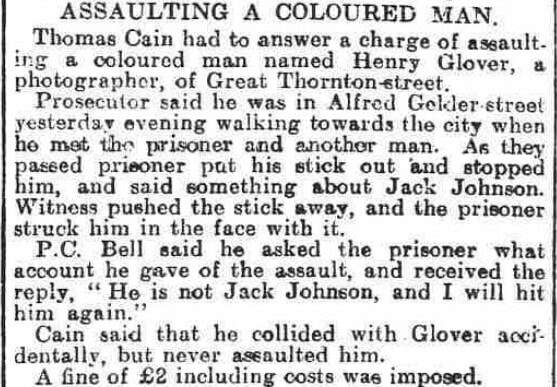 ​There is no record of Glover’s presence in the city until 1909 when he was the victim of a racist attack. On 22 February, he was walking along Alfred Gelder street towards the city centre when he was approached by Thomas Cain and another gentleman. As he walked passed, Cain put his stick out into Glover’s path muttering something about Jack Johnson, the Black American boxing champion. Glover then pushed the stick away which prompted Cain to hit him in the face with it. When officer P.C. Bell asked Cain about the assault he advised that Glover was not Jack Johnson, and threatened to hit him again. However, he later claimed that he had merely collided with the Black gentleman accidently but had not assaulted him. While Cain’s motivations cannot be ascertained this was likely a racist attack especially given the reference to Jack Johnson who had caused a stir in Britain and America after his unprecedented success in the boxing ring. Cain was found guilty of assault and fined £2 for the offence. Sadly, this was not the only time that Glover was embroiled in a court case as a victim. On 9 January 1911, he appeared in court accusing Jack Johnson, a local man of assault (again ties with the Black boxer were commented upon by the reporter in the Hull Daily Mail who pointed out the irony between this White local man and his Black opponent being the reverse to professional boxing proceedings). Glover told the court that on 22 December, he had called at 40 Nicholson Street, the house of Mrs Brewer, ‘to whom he paid weekly sums in respect to a child’ and was assaulted by Mr. Johnson, who hit him on the chest with a clenched fist and kicked him in the leg. The assault left Glover lame for weeks and he had to seek medical attention from Dr Nicholson. When he was cross-examined the Black photographer was asked to read some post cards received by Mr Brewer, however ‘after some laughable attempts to decipher them… he admitted he could only read Portuguese.’ It should be noted that the postcards had no relevance to the case, nor did the fact that Glover could not read in English, it would seem that this was done to embarrass or show in some way that the claimant was not an educated man. After further cross examinations regarding the regularity and amount paid to Mrs Brewer, Johnson’s legal representative said that he was going to ask the judge for Glover to be bound over to keep the peace as this event was a concoction of lies. 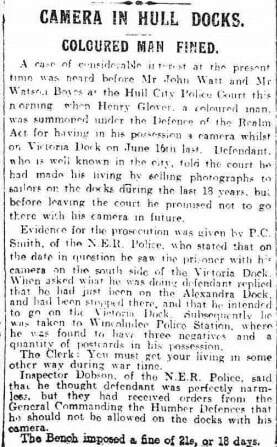 He also insisted that Glover had not paid Mrs Brewer anything for a considerable time and she had had to seek police protection from the Black photographer. ​He went on to state that, he had already been to court because Glover had threatened to murder Mrs Brewer and after entering the house he was put out by Mr Johnson. When more questions were posed to Glover he admitted he had broken into her home in October 1910. Once he gave this admission, Glover fainted and was taken outside for some air. The case was adjourned for 14 days, however further information remains difficult to obtain regarding sentencing. (Hull Daily Mail, 9 January 1911, p. 5). was physically described as 5 feet, 6 inches tall with a chest span of 31 and a half inches. However, by July Glover was transferred to the Royal Defence Corps, York as he was medically unfit to be employed overseas. On 3 September, he was passed over to the medical board where an assessment showed he was suffering with myalgia. The board recorded that this was “not the result of” but was “aggravated by” his military service and that he would “require medical treatment”. He was awarded a pension of 8/3 (eight shillings and threepence) a week and discharged from the Army on 24 September 1917. His character was recorded as “Good”. 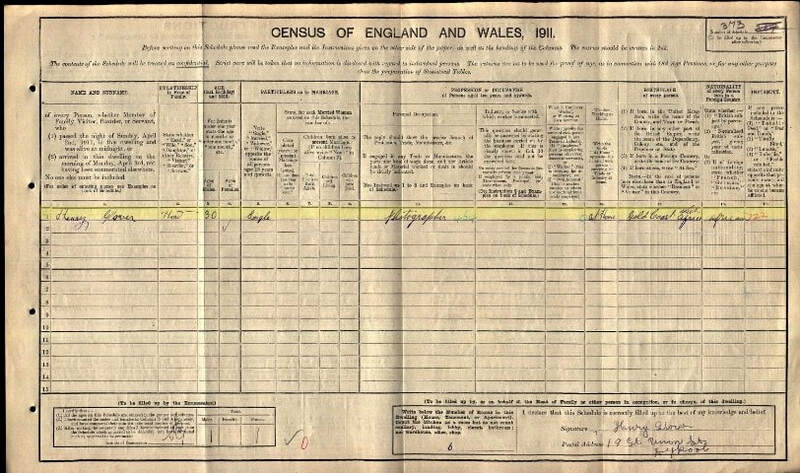 Interestingly, on his discharge, his age was given as 53 and his date of birth as May 1864. If this was correct, he should never have been called up for military service in the first place, as the upper age limit for conscription in the First World War was 41. Below are photographs of the location of Henry Glover's house on Great Union Street. If you have any further information about Henry Glover or are in possession of one of his photographs, please click here to contact us.